New Estes Proto-X RTFs in Multiple Colors Featuring Auto-Upright Stability « Big Squid RC – RC Car and Truck News, Reviews, Videos, and More! The mighty little Estes Proto-X has become a huge phenomenon. With their low price point and huge fun factor, everyone (and their Uncle, and their Uncle’s dog) bought one. However, if you’ve flown your Proto-X as much as we have, you already know they do eventually wear out. For all you guys needing a new Proto-X, Estes has announced that you can now get them in Six Different Colors. The colors are the original black, plus green, purple, red, white and yellow. But that isn’t the only thing different on the new Proto-Xs, they now come with an Auto-Upright Stability feature that makes hand launching a breeze. The part numbers are #ESTE48** and the price stays the same at just $39. To be the first person on your block to have a Proto-X in one of the new colors, hit up This Link over on the Tower Hobbies website to get yours on pre-order. 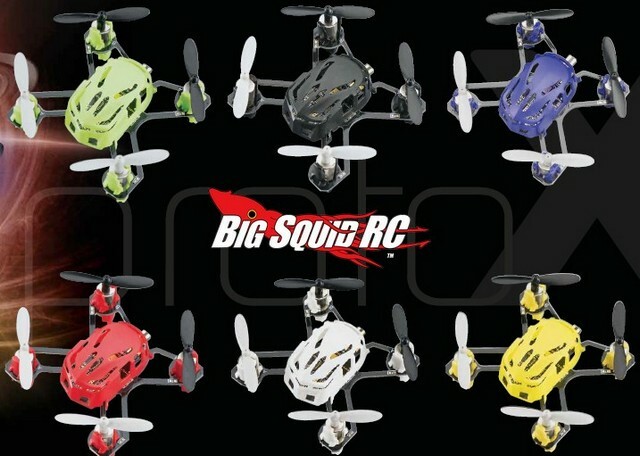 Click Here to read more Proto-X news on BigSquidRC.